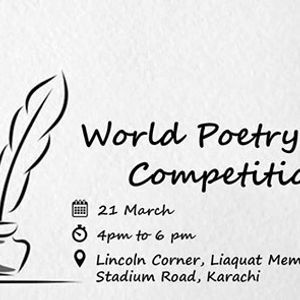 Join us for an exciting poetry competition for young people aged 18 and above at the Lincoln Corner Karachi, Liaquat Memorial Library as we celebrate aspiring English poets on this world poetry day. Channel your inner poet by bringing your personal poems at our podium corner and let your inner poet flourish. 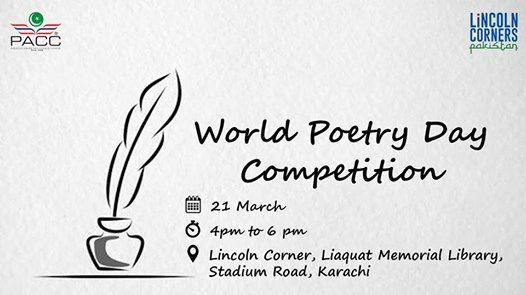 Your poetry and recital will be judged and winners will be awarded prizes to acknowledge their spirit and enthusiasm. The theme for the poetry competition is " Women rights or Human rights?". We look forward to your participation and enthusiasm.